Neurons outnumber glia? Yup, a fact learned from a NeuroMOOCer – The brain is sooooo cool! 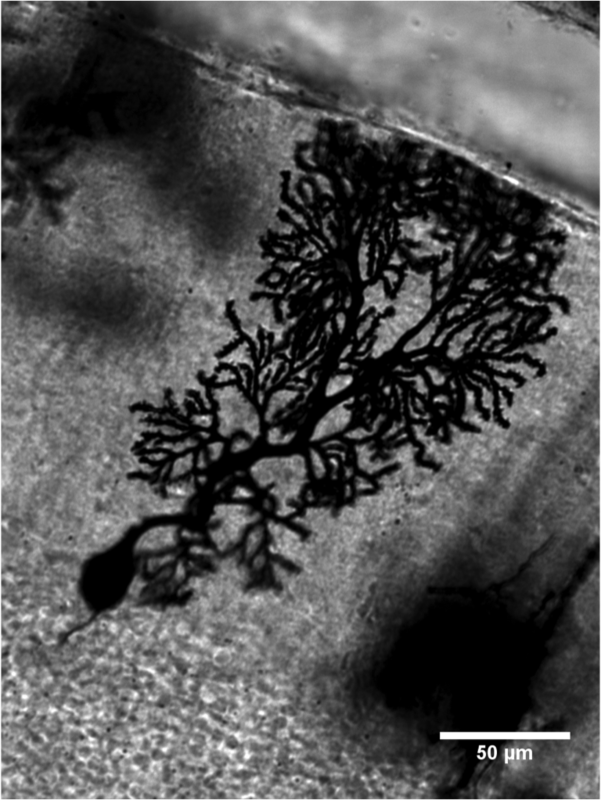 This photomicrograph is of a cerebellar Purkinje cell in the mouse which has been revealed by the Golgi stain. Not everything you learned in grade school is true as this paper shows, there are not ten times as many glia as neurons in the human brain. Let me address this latter point first. Right-o! Very satisfying indeed. I have been as surprised as my colleague about the incredible thoughtfulness, intelligence and knowledge of NeuroMOOCers. Students in Understanding the Brain continue to amaze and impress. I now am sure that those who underestimate the public’s ability to understand and parse science, do so at their own risk. Now on to the topic at hand. 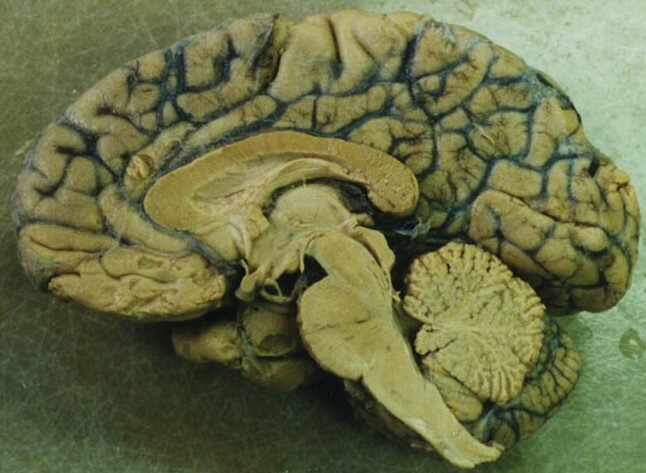 How many cells are there in the brain and what proportion of the cells are glia? Herculano-Houzel and colleagues figured the answers out using a novel method that her laboratory devised. This method uses flow cytometry, a process that employs an instrument called a cell sorter. Essentially, the process involves mashing up the brain and then labeling the cells of the brain with dyes that recognize either all cells (the dye is DAPI which labels DNA) or recognizes only neurons (NeuN which labels only neurons but not all neurons; a small number of neurons are not labeled with antibodies to NeuN). To cut to the chase, they found that the human brain has about 85 billion neurons and about 85 billion glia for a glia: neuron ratio of 1:1 rather than 10:1. Right off the bat, we learn that cells (remember this is cells inclusive of both neurons and glia) are not evenly packed through the brain. We have long known that the cerebellum contains far more than its fair share of cells. The commonly repeated adage that cerebellar granule cells constitute roughly half of all the brain’s neurons may be on target as the cerebellum houses half of the brain’s cells (even despite its proportionately small size, 10% of the whole brain). The glia to neuron ratio varies widely across areas of the brain, with the highest value in the diencephalon + brainstem and the lowest value in the telencephalon. 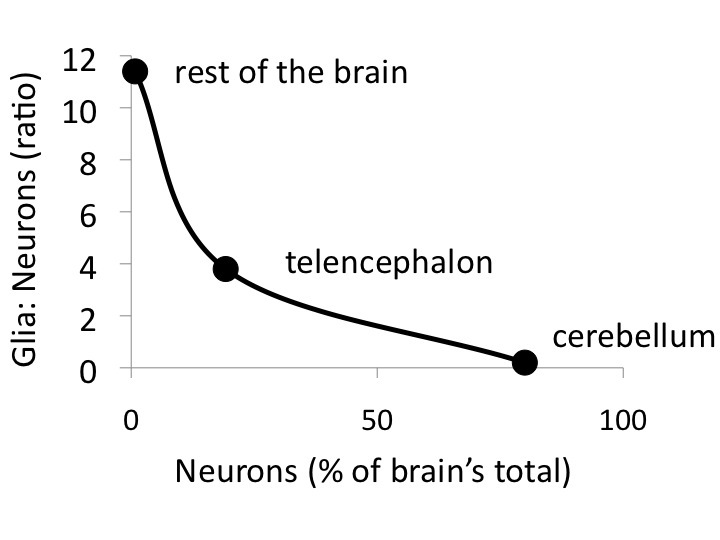 These numbers tell us that the glia to neuron ratio varies by more than one order of magnitude, from 0.2 in the cerebellum to 11.4 in the diencephalon plus brainstem. It is interesting to note that the glia to neuron ratio appears to be greatest in the region with the greatest neuronal diversity. Of these regions, the cerebellum contains the fewest neuronal types and the brainstem contains the greatest number of neuronal types. In addition, by picking out the neurons specifically, we see that the cerebellum, while containing about half of all the brain’s cells, contains a whopping 80% of the brain’s neurons. Granule cells make up virtually the entire complement of cerebellar neurons. Human brain size is in line with primate brain-to-body scaling: If you are interested in comparing human brains to the brains of other animals (comparative neuroanatomy), a common approach is to express brain size in relation to body size across mammals. Larger animals require larger brains. Essentially the brain:body ratio allows us to compare brains (apples) to brains (apples). Consistently, “smart” species such as humans deviate from the overall mammalian brain:body line, meaning that their brain is bigger than a typical mammalian brain of our body size. However, Herculano-Houzel and colleagues show that humans fall exactly on the primate brain:body line. In fact rather than us having a disproportionately large brain for our body size, it turns out that gorillas and orangutans have much larger bodies than would be expected for their brain size. Because brain size is not highly correlated to body size, Herculano-Houzel and colleagues speculate that body size may not be predictive or mechanistically related to brain size. Instead, cellular scaling rules that relate the number of neurons to brain size appear highly predictive within (but not between) mammalian orders (see next section). The scaling rules for brains varies across mammalian orders: Herculano-Houzel and colleagues studied brains from several species in three different orders: primate, rodent, and insectivore. 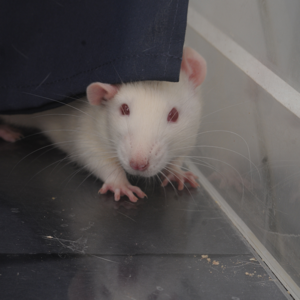 Across rodents, the size of the brain increases faster than does the number of neurons, suggesting that among rodent species, larger brains contain much larger neurons. In contrast, primate neurons are roughly the same size in brains of different sizes. Another way to imagine this is to consider the effect of increasing the number of neurons by 10 times in a typical rodent and a typical primate. A rodent brain would be 35 times as large whereas a primate brain would increase in size proportionately (increasing volume by 11 times) for a 1o-fold increase in neurons. Herculano-Houzel and colleagues advance the idea that primate scaling is perfect for packing in lots more neurons without making the brain humongous. The rodent brain is far less economical. To illustrate this, a rodent with a 1.5 kg (about 3 pounds) brain would have 1/7th the number of neurons that humans have. Conversely, a rodent with 86 billion neurons (as is found in human brains) would need a 77 pound (35 kg) brain to house all those neurons at rodent packing densities. In essence we primates have brains that hold many neurons in a relatively small cranium. Ultimately, this exciting work coming from the Brazilian neuroscientist, Suzana Herculano-Houzel, provides much needed data regarding how anatomical features of brain relate, or don’t relate, to intelligence. Lucky me to be teaching such a stupendous group of students!! Dear Peggy, many thanks for the very thorough review of our work! You might like to hear about our most recent paper comparing the elephant brain to the human brain. I also gave a TED talk on how the human brain is not special. Both are available in our lab website: http://www.suzanaherculanohouzel.com/lab. Thanks so much for stopping by. Your work is enlightening. I’ll check out the elephant story. The cerebellum is my favorite thing we’ve learned about in class so far. When you think about it, it makes perfect sense that *someone* has to be devoting a lot of energy to managing all that movement stuff, but I never thought about it until this week. Given what we’ve learned this week, I am not a bit surprised that the cerebellum is such a big proportion of the brain’s neurons! As someone who programmed computers for 30 years, I loved learning about efference copies, and comparing copies of the motor cortex’s messages with feedback from the part that was supposed to move…. And fixing everything so it’s right, in real time, on the fly, in many parts of the body all at once……….. Wow. Sooooo cool, indeed! http://www.salon.com/2015/03/02/she_will_dance_at_her_wedding_healing_the_girl_born_without_part_of_her_brain/ what do you think Dr. Mason? John P.J. Pinel of University of British Columbia noticed that paper and cited it in his 2014 textbook Biopsychology. 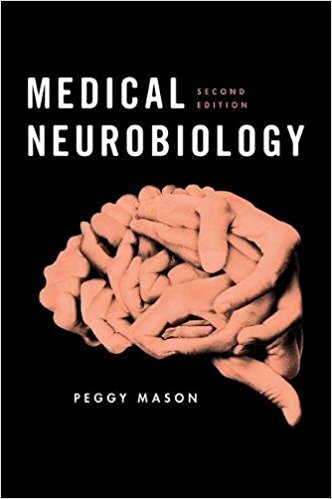 It will be in the second edition of my textbook, Medical Neurobiology, due out in 2017 from OUP.